Why Choose Upper Cervical Chiropractic? As Upper Cervical Doctors, we use a gentle, non-invasive technique that does not create the “popping and cracking” that you may have experienced with other types of care. Our evaluation includes neurological tests, thermographic instrumentation, and precision x-rays to determine any spinal misalignment. After the correction at the top of the neck is made, the healing process begins, restoring body balance, boosting immune function, and allowing the patient to return to a state of wellness. The Upper Cervical Corrective Procedure that Newhouse Health Solutions incorporates is a specific adjustment performed according to the patient’s anatomy that is designed to restore the body’s natural ability to regain and maintain optimal health. Due to the style of adjusting and how well the individual responds, most patients receive long-lasting results that allow the body to heal and function at its peak potential. The brain controls all functions of the body. It sends healing messages by way of the brain stem, passing through the neck, down the spinal cord and out over the entire nervous system to all parts of the body. The brain is like a central computer and the nervous system is like a network that relays the messages back and forth from it to different parts of the body. Both the brain and the spinal cord are protected by bone--the brain by the bones of the skull, and the spinal cord by the set of ring-shaped bones called vertebrae that make up the spine. Your head, which weighs about 10 pounds, balances delicately on a vertebrae known as the atlas (the first bone in your neck), which in turn sits on a vertebrae called the axis (the second bone in your neck). These vertebrae surround your brain stem, which is responsible for all survival mechanisms--breathing, digestion, heart rate and blood pressure. 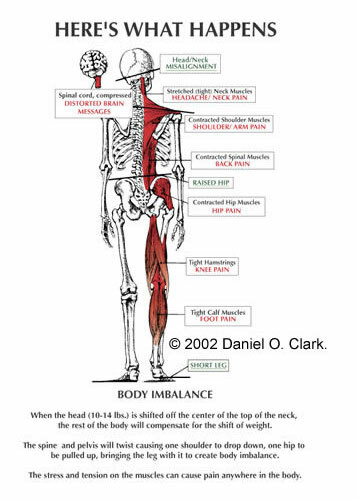 If your atlas and axis shift off of the center of your spine, your head and neck will become misaligned, which can cause interference to the normal flow of your nervous system. This interference or irritation is called an upper cervical subluxation. When the head is shifted off the center of the top of the neck, the rest of the body will compensate for the shift of the weight. The spine and pelvis will twist causing one shoulder to drop down, one hip is pulled up, bringing the leg with it to create body imbalance (short leg). The stress and tension can cause migraines, neck, shoulder, back, hip, knee and other body pain. This head/neck misalignment can disrupt or distort the efficient flow of brain messages to the body which leads to the development of both acute and chronic health problems. How Does a Misalignment Occur? Auto accidents, falls, whiplash, bumps on the head, sports injuries, or even a difficult birth process can cause muscles and ligaments on one side of the neck to contract and hold the head and neck in a misaligned position. How Do We Determine Misalignment? At Newhouse Health Solutions, we analyze precise x-rays of the head and neck. These x-rays will show the degree of head and neck misalignment, and give us a crystal clear picture of how to realign the head and neck to reactivate the body’s natural ability to regain and maintain optimum health. How Do We Perform the Correction? The correction performed is unique to the individual and his or her specific anatomy from the x-rays analyzed. It is a light, non-forceful adjustment barely felt by the patient and requires no popping, cracking, twisting or jerking motion. How Does the Correction Work? The procedure is designed to correct head/neck misalignment and allow efficient flow of healing messages from the brain to all parts of the body. As soon as the misalignment is corrected, the muscles begin to relax, oxygen and blood circulation are increased and the immune system is enhanced. Immediately the body begins the process of self healing. On follow up visits, our goal is to help the patient maintain his or her alignment to prevent any interruption in the body’s natural self-healing process until it is complete. The results can be dramatic and some patients report immediate relief of symptoms. Click on our success stories to read about specific results.